"Serve with salad for lunch or soup and salad for a meal." Spread butter or margarine on the outsides of the bread slices. Spread sour cream on the insides of the bread slices. Then layer sandwich as follows: Bread slice, cheese slice, chicken, ham, 2nd cheese slice, 2nd bread slice. In a small skillet over medium heat, grill sandwich until meat is heated through and cheese has melted. This was good....hubby really liked it. I am not a huge Swiss cheese fan, so I used provel instead. I really liked. Great easy recipe...thanks. Pretty good, I subbed dijon mustard for the sour cream. Nice change from the norm, thanks Deirdre! These were pretty good. A nice change from regular grilled cheese, but not a very good sub for real chicken Cordon bleu. Yummy! Use only a light smear of sour cream and maybe next time I will only use one slice of cheese per sandwich. There has to be about 800 calories in this sandwich! No wonder it tastes so good! Yum! 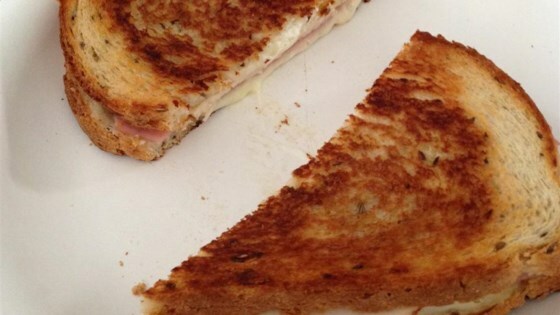 This will be a new favorite at our house to replace those boring grilled cheese sandwiches.